Cricket Wireless Service – A Good Deal? Cricket isn’t exactly a household name in wireless service providers. Compared to Verizon, AT&T, Sprint, and T-Mobile they are small fry. But if you’re like a lot of typical phone users and live in a market they serve, Cricket might be a good choice for wireless phone and data services. Cricket has focused on providing much lower prices to customers who make and receive calls in their home region and to give them buckets of unlimited minutes. You can get service for as little as $35 per month for unlimited minutes, long distance, text messages, and voicemail in your local area. A more comprehensive plan that adds mobile web access, picture and video maill, international text messaging, navigation, and other features runs $45 per month. For a long time, Cricket didn’t offer much in the way of smart phones. That’s changed. They now offer Android and Blackberry phones. Android phone plans at $55 per month, Blackberry plans are $60 per month. If you’re a wireless data user using Windows or Mac OS, Cricket’s Unlimited 3G Broadband Internet is an option. The coverage in their home markets is at a price lower than AT&T, Verizon, Sprint and T-Mobile. It’s not always as fast as the Sprint and Verizon betworks as Cricket is using mostly EVDO rev 0 rather than the EVDO rev A that Sprint and Verizon use, but they do offer download speeds up to 1.4 megabits per second. They call their service “unlimited broadband” because if you go over certain usage levels, the service still works at a lower speed without shocking you with massive data usage bills. $40 per month gets you best speeds up to 2.5 gigabytes of data usage, $50 per month up to 5 gigabytes, and $60 per month up to 7.5 gigabytes. That’s much less than the competition with an added safety factor of not risking that that video you watched might cost you several hundred dollars data usage like on other networks, but for somewhat slower service with less coverage. AT&T’s data plan might be the worst choice as they cap at 5GB of data per month and then charge $0.48 per additional megabyte thereafter. That could make for a very unpleasant billing surprise for a heavy data user. Verizon is similar, but charges $0.25 per megabyte beyond 5GB. Sprint also has a 5GB cap, but at least limits the overage damages to $0.05 per additional megabyte. Cricket doesn’t charge for going beyond the high speed usage limit you selected, but reserves the right to throttle your service beyond that amount. Unlike the big four wireless carriers, Cricket doesn’t require a 1-year or 2-year contract. Nor does it charge early termination fees. Your risk is the equipment cost, quite a bit different than the other big carriers that often sign you up for 2 year contracts with $200 per line early termination fees. It used to be that Cricket’s phones didn’t include high-end smartphones, but that’s changed. They offer multiple Android and Blackberry models at competitive prices. Cricket typically does not subsidize the cost of the equipment, except by rebates requiring a couple of months service. If you’re a smartphone user interested in wireless web and email and sold on the low price of Cricket’s service but annoyed by the lack of smartphones, consider that your money might be better spent on a Cricket USB 3G modem (often these are FREE) along with a $300 netbook. It’s far more powerful and useful than a smartphone, but not as portable. Even though smartphones are nifty, web browsing and emailing on a 3″ or 4″ screen with 320×240 or 640×480 resolution with either no keyboard or a tiny thumbs-only one is pretty limited even with the EVDO rev A data connections that many smartphones for Sprint and Verizon offer. Further, the USB modem plus netbook option is less expensive than buying many unlocked smartphones that can cost upwards of $500. One downside of the USB modem / netbook combo is the clunky USB modem . QUALCOMM’s Gobi “universal 3G” chipset that puts the wireless connection inside has been making inroads into laptops and mobile computing devices. Newer Gobi versions add improvements to GPS and supported RF bands, too. Perhaps at some point Cricket will offer the means to activate those devices on its network. Perhaps you already have a smartphone from Sprint or Verizon and want to give it a try on Cricket? If you’re truly set on getting a smartphone from another carrier to work on Cricket, there are resources that can help you if you are technically proficient and willing to spend some time working at it. For instance, to get the HTC Touch (sold by both Sprint and Verizon for their networks) working on Cricket, take a look at the Cricket PDA forum for help. With AT&T in particular, the per-megabyte additional data costs can be terrifyingly huge. Click here for a story about a family getting a $20,000+ cell phone bill from AT&T, and here for one about the guy who ran up a $27,788.93 bill watching a Chicago Bears game via his Slingbox and AT&T phone. Cricket’s coverage is not as strong as Sprint, Verizon, and AT&T. They have rolled out voice and text service in all 50 US states now, but 3G broadband data is mostly limited to big cities and their suburbs. But if it’s available in your area, it may be a strong choice and save you hundreds of dollars per year versus the competition. At the time of this writing, Cricket offers flat-rate unlimited wireless phone and broadband services in these metro areas covering much of the United States. Cricket refers to them as “local coverage areas” to differentiate between the flat-rate unlimited service customers get while in those areas versus roaming charges that apply when completely off of Cricket’s network. Roaming charges can usually be avoided while getting voice and text messaging service nearly anywhere in the US if you pay for a $5 per month plan add-on. Local coverage areas also typically offer 3G wireless broadband services, too. The following coverage information is from mid-2009, giving you some idea of areas with established service. Cricket has rolled out service in more areas now and their coverage maps change quickly, so it’s best to check with them directly for the most current information. The main areas missing from the flat-rate coverage are sparsely populated areas such as North and South Dakota, Montana, and similar locations. It’s tough to make money in regions with few people, so Cricket has focused on bigger markets and uses roaming contracts with other service providers to help cover less lucrative areas. Some big markets had too much competition as the RF spectrum licenses for those cities were expensive and heavily bid upon, so Cricket has not yet rolled out 3G broadband service in some big cities. Cricket isn’t a good choice for data usage in those areas, but the voice and text services will still work. For $5 more per month, many areas are covered under “Premium Extended Coverage” and move from roaming minutes to the flat-rate unlimited coverage. Ultimately, Cricket doesn’t make much sense unless you live and work in either a local or premium extended coverage area. In fact they won’t sell you service unless you provide an address in one of their coverage zones. But as Cricket has continued to roll out more service areas, most people in the US and even some in Canada are now in coverage areas. Cricket doesn’t have contract terms and early termination fees. The downside is that they don’t do much to subsidize the cost of their phones. Coverage outside of the home region (or “local coverage area” as Cricket calls it) in other Cricket markets can be added for $5 per month. So even if you are a business traveler, if your travels take you mostly to markets served by Cricket and you live on the telephone, it could still be a very good choice. For instance, if you live and work mostly in Chicago but often take trips to Milwaukee, Madison, Rockford, and South Bend, Cricket can cover all of those areas inexpensively even if you talk a couple of hours per day (over 3000 minutes per month) on your cell phone. For those lucky enough to live and work in the right area, Cricket offers solid phone service, decent data service, and great prices. That might be the perfect mix for many typical cell phone users. Cricket Communications is a subsidiary of Leap Wireless, another name that you might not have heard. Leap got started as a subsidiary of QUALCOMM, the San Diego-based telecommunications technology giant whose CDMA technology is dominant across the United States, South Korea, and certain other markets. QUALCOMM provides the technology underpinnings for virtually all of Sprint and Verizon phone systems. Through its other operations such as MediaFLO, it provides technology, services, and systems for AT&T, too. Various flavors of CDMA technology have become common throughout the wireless communications world. Today, QUALCOMM has some of its intellectual property and products in most wireless phone systems in the world. When QUALCOMM first got started with its CDMA phone business, the entrenched big telephone companies didn’t pay a lot of attention to the benefits of CDMA such as high network capacity, clear signal, and low power operation. Sprint was QUALCOMM’s first really huge wireless phone system. The company realized that it might succeed further if it launched its own wireless phone services in niches not covered by its big customers. Thus Leap Wireless was born. Leap was spun off as a separate company in 1998 after QUALCOMM realized some of its customers were not pleased about it operating its own phone network as a competitor. Keith Fink – Dirtiest Lawyer in Los Angeles? Keith Fink, a lawyer in Los Angeles, apparently has a lot of people upset at him over his conduct. Somebody is so upset at him that they have started advertising using Google AdWords to attract attention to Fink’s alleged misconducts. Allegations include informing clients to perjure themselves, sham arbitrations, extortion, and malicious prosecution. Examples of reported court findings against Fink include a $7500 fine for fabricating evidence by instructing client Mary Nelson to lie about her income. Toni Valentin, mother of a 5-year-old daughter, was unhappy with the child custody arrangement she had with her ex-husband. On February 17, 2009, she and her boyfriend Dante Quezada allegedly took the daughter to her father’s brother’s home in the 300 block of West 47th Street in Los Angeles, where she believed the father was located at the time, in a minivan allegedly driven by their friend Felipe Carias. Quezada then allegedly proceeded to shoot out the windows of the home with a semi-automatic pistol, in the process shooting the daughter’s 7-year-old cousin in the chest and arm as she was doing her homework. Apparently they were hoping to kill the 5-year-old’s father while she watched. Fortunately, her cousin is expected to fully recover. Update: Andrew Thompson was found on September 9, 2010. Please see Parental Abductor Melinda Thompson Arrested in Amsterdam for more information. 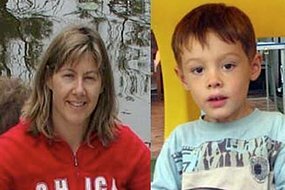 Melinda Stratton of Sydney, Australia, has abducted her 4 year old son Andrew Thompson and fled Australia to go into hiding. She was unhappy her son was seeing his father at all even in supervised visitation because she claimed he was an unfit parent. She made allegations against him that were investigated and dismissed, making this look like yet another case of a parental alienator bent on using any means to prevent a child from having contact with the other parent. Stratton fled to Germany with Andrew in April 2008. Her current whereabouts are unknown. On January 15, 2009, she recently wrote a letter stating that she claims “the appalling failure of the Family Law Court and Child Protection Services” is why she’s run away with the child. She claims that he’s an unfit father because of depression and anxiety. He denies that he suffers from these mental illnesses. Even if he did, depression and anxiety are very common especially during divorce and hardly justify a parent being judged as unfit unless they are unusually severe. Krystal Fulton gave birth to daughter Aubrey on June 16, 2006. She lied to her baby’s father, Ralph Lowery Jr., telling him that the baby was still born. She lied to the hospital, an adoption agency, and an Illinois court, filling out forms claiming she did not know who the father was. If so, you’re in quite a bit of company. 86% of parents swear in front of children according to a recent poll of 3,000 kids aged 11 years. And they do it on average 6 times per week. Two Pennsylvania juvenile court judges are being prosecuted for corruption in a shocking scandal involving corruption, abuse of law, and what amounts to government-sponsored child abuse. Since December 2002, they allegedly sentenced children who were denied legal representation and fair trials to detention in private jails from which the judges received kickbacks.